Premium quality, nitrile based corkelastomer jointing developed to meet the requirements of Ministry of Defence Specifications BS2F66 and DEF22. Previously designated Nebar® A/CT. • High compressibility at low bolt loadings. • Resists a wide range of fluid media. • Retains flexibility down to –20°C. 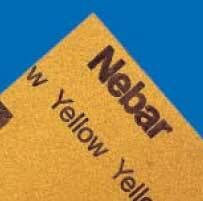 • All Nebar products are easy to cut, handle and install. Tested to BS2F66 and conforms to DEF22. Complies with Rover GC2403.